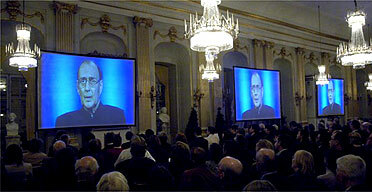 Harold Pinter delivering his Nobel lecture via video to the Swedish Academy in Stockholm. Truth in drama is forever elusive. You never quite find it but the search for it is compulsive. The search is clearly what drives the endeavour. The search is your task. More often than not you stumble upon the truth in the dark, colliding with it or just glimpsing an image or a shape which seems to correspond to the truth, often without realising that you have done so. But the real truth is that there never is any such thing as one truth to be found in dramatic art. There are many. These truths challenge each other, recoil from each other, reflect each other, ignore each other, tease each other, are blind to each other. Sometimes you feel you have the truth of a moment in your hand, then it slips through your fingers and is lost. I have often been asked how my plays come about. I cannot say. Nor can I ever sum up my plays, except to say that this is what happened. That is what they said. That is what they did. Where was the dead body found? Who found the dead body? Was the dead body dead when found? How was the dead body found?